What explains the lasting legacy of D’Arcy Thompson’s ‘On Growth and Form’? A century on from the publication of the first issue, we reached out to authors from Development’s special issue celebrating the centenary and asked what the book meant to them. 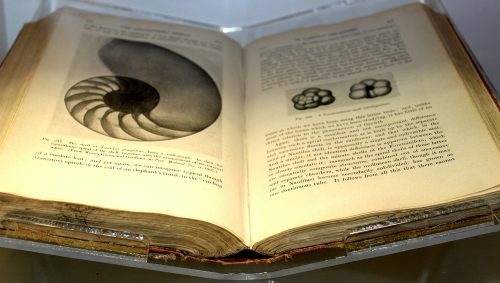 A rare first edition of On Growth and Form held in the D’Arcy Thompson Zoology Museum in the University of Dundee. Find out more about the museum in our interview with its curator Matthew Jarron here. “DR is an experimentalist biophysicist, working on acto-myosin as well as cell adhesion and motility in vitro; FG is at the interface between tissues and foams, and between theory and experiments. We have been knowing each other 20 years ago, while we were in the same lab in Grenoble, and our first discussions in 1999 made already clear that MDCK cells monolayers cellular outlines were not following rules of shapes for bubbles (see our original MDCK image below). Tissues as foams ? 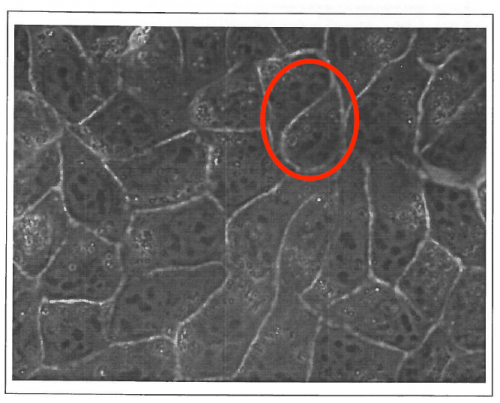 The original 1999 image with MDCK epithelial cells observed by phase contrast microscopy which triggered the first discussions between the authors. In the highlighted zone, these cellular outlines would not be possible in foams. We both then moved to different scientific sites, and we started to interact again in 2010 around a new Master program launched by DR in Strasbourg University, where we gave interdisciplinary lectures to the same students. DR suggested to share classics pages with students on considering living matter as a matter, such as Thompson book proposes, with modern echoes in developmental biology. FG was reluctant in considering these pages as actually seminal: he rather considered that they had been causing a waste of time over the century, by triggering inadequate searches for simplicity and perfection. These distinct appreciations of ‘On Growth and Form’ nurtured between us an animated debate. We decided to focus on two chapters which were central for us, i.e. on shape and packing of cells in tissues. Our disagreement was so strong that it was difficult to imagine that we would agree on a common flow; initially, we had no agenda whatsoever to wrap up this discussion in an article one day. We turned this debate into a scientific approach, by carefully listing specific arguments and counter-arguments. And then, we both moved from our original respective postures. DR recognized that Thompson had been merging phenomena under the same umbrella, with often analogy as a guideline and limited care about physical mechanisms. FG acknowledged the influence of Thompson in general and even on his own work for several aspects, and particularly the illuminating ability of Thompson to act as honest experimentalist representing tissues through their essential read-outs – cell contours, representing them as they actually are. We had just decided to write an article when, by coincidence, Development launched a call for its special issue. 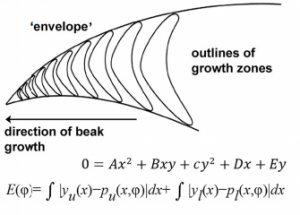 D’Arcy Thompson certainly was a (maybe too) strong advocate of the role of physical forces in development, but as we are collecting more and more evidence of a widespread role of mechanical signals in morphogenesis and cell behavior, his take on development also offers a source of inspiration for the young generation of interdisciplinarians in development. The simplicity of these words has many implications. It underlines the fact that changing shape is not only a geometrical problem: it also involves a structural change, and thus, that changing patterns of forces must be managed by cells. Not as immediately obvious, this statement also implies that a living object will usually try to resist such forces. 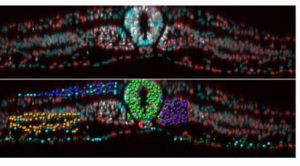 There are now many examples of cells displaying such resistance strategies, from changes in cell growth rate, to cell polarity or extracellular matrix stiffening. This also is true at tissue and organ scales, the most obvious example being Wolff’s law, which is mentioned in D’Arcy’s book, where bones build their intricate trabeculae network along maximal mechanical stress lines. 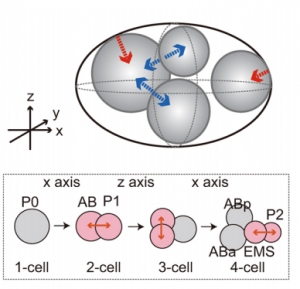 We, and others, found similar responses in plants, with cells and tissues reinforcing their structure in the direction of maximal stress too, making this statement from physics, a true biological theorem. D’Arcy Thompson was a supporter of the organismal theory of development, and this quote is also consistent with that option, diagrams of forces spreading, and arguably, synchronizing, populations of cells. While this leaves out many subtleties, it remains a very powerful reminder of the fact that cells manage communication, nutrition, reproduction, etc. and while doing all this, also need to maintain their own structural integrity, which calls for synergies between biochemical and mechanical signalling. “Throughout the book, which I read in a French translation of the abridged John Tyler Bonner version, D’Arcy Thompson tried to use physics and mathematics to explain the shape of life forms. This was an audacious project, since the living world remained a big mystery at that time. D’Arcy Thompson foresaw the great utility of physics and mathematics in studying growth and form, while admitted that they could not explain all the living phenomena. He stressed the importance of material and mechanical nature of life, considering that a living form was nothing else than “a force diagram”. D’Arcy Thompson illustrated the beauty of a wide variety of species through mathematical description. He pointed out the similarities between seemingly unrelated things, linking the natural phenomena with physical laws. Modern research on morphogenesis has proved that many of these intuitions were correct.